The Tibetan government-in-exile has appealed to the international community to intervene in a Chinese security crackdown in Tibet’s capital. 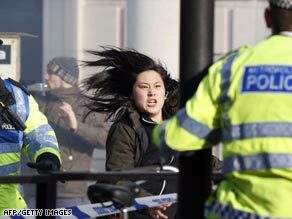 But the leaders-in-exile say they are concerned that China’s “hardline policies” may lead to a repeat of last year’s deadly anti-Chinese riots. The website of the French embassy in Beijing has apparently come under cyber-attack after President Nicolas Sarkozy outraged the Chinese government by meeting the Dalai Lama. The authorities in Beijing issued a stern denunciation of the meeting last week, cancelled an EU-China summit and said trade with France might suffer. A spokesman for the Foreign Ministry rejected any suggestion that the Chinese government might approve of the cyber-attack, reported to have made the embassy’s website inaccessible for several days. “From the perspective of the Chinese government, China is against the hacking of the websites of the embassies of other nations,” its spokesman, Liu Jianchao, said. Nevertheless, relations between China and France remain at a low. France has gone into diplomatic overdrive since the meeting to soothe China’s hurt feelings. 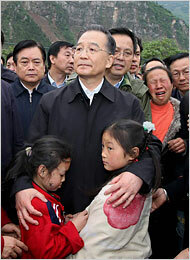 Mr Sarkozy called China “one of the greats of the world” on Monday and stressed he supported “one China”. On Tuesday, his foreign minister, Bernard Kouchner, who was appointed in part due to his work on human rights, weighed in. “We did not want to cause offence to China, to the Chinese people or to Chinese leaders,” he told a French parliamentary committee. The cyber-attack is believed to have taken the form of mass attempts to access the site simultaneously, largely at night, disabling the system. There are numerous informal hacking groups in China, some of which are believed to operate for nationalistic purposes, including attempts to access Pentagon and European defence ministry websites. In a move which has China fuming, French President Nicolas Sarkozy met with Tibetan spiritual leader the Dalai Lama Saturday at a gathering of Nobel Peace Prize laureates in Gdansk, Poland. “The Dalai Lama confirmed what I already knew, that he will not demand independence for Tibet and I told him how important I thought it was to pursue dialogue between the Dalai Lama and Chinese authorities,” Sarkozy said after their meeting. “The Dalai Lama also told me of his concerns over Tibet,” Sarkozy said, adding that the 73-year-old “indicated how much he supported my visit to Beijing for the Olympic Games” opening ceremony. The president’s decision to travel in August inflamed France‘s political opposition and human rights campaigners. 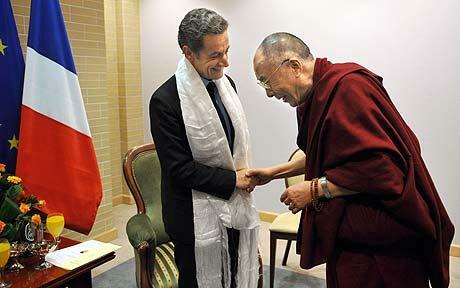 Sarkozy is the only European head of state to meet the Dalai Lama while holding the EU’s rotating presidency. 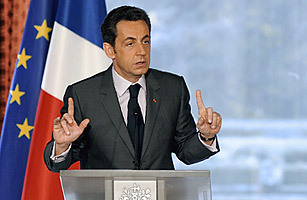 Addressing China’s outrage over his move to meet the exiled Tibetan spiritual leader, Sarkozy said: “One must approach this calmly. The French leader’s decision to go ahead with the meeting has so far seen Beijing retaliate by scrapping a China-EU summit in France and warning multi-billion-dollar bilateral China-France trade deals could suffer. “We have not noticed any kind of start of a boycott of our products,” a French presidential official told AFP Saturday. Why Can’t France, Sarkozy Get International Respect?